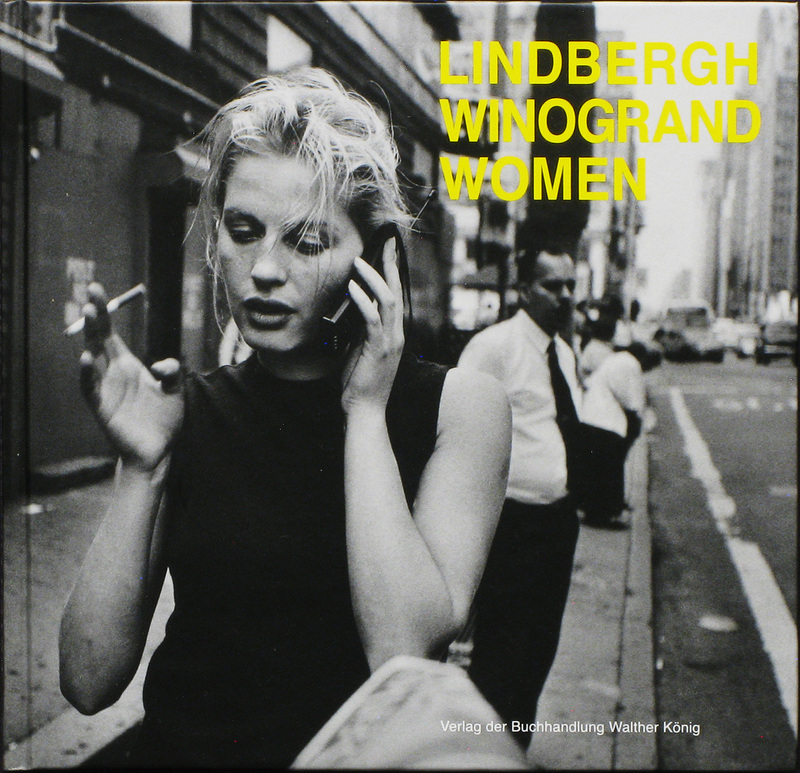 Book Review Lindbergh Winogrand Women By Garry Winogrand and Peter Lindbergh. Reviewed by Blake Andrews Lindbergh's project intersperses photographs from Winogrand's 1975 book Women Are Beautiful with a heavier dose of his own On Street, a series based on a young fashion model walking the gritty sidewalks of contemporary New York. Photographs by Garry Winogrand and Peter Lindbergh. Koenig Books, 2017. Photographs by Garry Winogrand and Peter Lindbergh. Text by Joel Meyerowitz and Ralph Goetz. Koenig Books, Köln, Germany, 2017. In English and German. 140 pp., four-color and black-and-white illustrations, 8¾x9x¾". At first blush street photography and fashion photography don't have much in common. Street photographers work without preconception, using chance and improvisation. The resulting image is meant to be a self-contained entity without an ulterior motive. Fashion shooters typically work under more controlled conditions — often in an artificially lit studio — with output geared toward a specific style or product placement. Lindbergh Winogrand Women Photographs by Garry Winogrand and Peter Lindbergh. Koenig Books, 2017. But perhaps they share more in common than meets the eye. As a thought experiment, what if you sprung loose a fashion model on a busy urban sidewalk, shot her in passing, and compared the results to found street photos? To push the issue, what if the comparison were to the foremost street photographer in history, Garry Winogrand? Would the fashion shots hold up in that company? Would they feel charged with street energy? In this context, would fashion still seem inherently different than candid photographs of strangers? These are among the questions raised by Peter Lindbergh's latest book Lindbergh Winogrand Women, published in correlation with an exhibition in Dusseldorf last spring. Lindbergh's project intersperses photographs from Winogrand's 1975 book Women Are Beautiful with a heavier dose (roughly 3:1 ratio?) of his own On Street, a series based on a young fashion model walking the gritty sidewalks of contemporary New York. Lindbergh may employ a model but his inner street shooter yearns for unstaged candor. "I wanna photograph real people," he writes in the book, "not the model. What I'm interested in, is to find a certain reality behind the facade." Toward this end, he employs Winogrand's methodology. He uses a wide angle lens and black-and-white w conversion to capture the chaos of found pedestrian scenes in New York. His admiration for the master is clear, and the project is an homage of sorts. Winogrand quotes are followed in the book a page later by similar Lindbergh quotes. Winogrand's photos are generally sequenced with similar scenes shot by Lindbergh — Winogrand's photograph of women gesturing on a park bench followed by a Lindbergh photo of his model on a park bench, for one. Or Winogrand's posterior shot of a skirted woman framed at distance followed by Lindbergh's similar photo. Other sequences follow suit. If imitation is the sincerest form of flattery, it's clear Lindbergh is a Winogrand fan. But the photographs from On Street have a tough time standing up next to those from Women Are Beautiful. To be fair that's not entirely Lindbergh's fault. Winogrand leaves all challengers in the dust. His snapshot aesthetic and restless curiosity may appear accessible to the casual observer — and perhaps entrancing to a fashion shooter — but its loose nature belies his mastery. Even though emulating Winogrand is a Sisyphean task, Lindbergh has given it a shot. But Lindbergh's photographs of a model walking the sidewalks feel like fashion, not street. Whatever realistic edge they possess is continually blunted by their main subject, a beautiful blonde model wearing haute couture: To his credit, Lindbergh has dispensed with makeup or excessive styling. He wants reality. But supermodels don't easily blend into the everyday. Dressed to the nines, interacting with no one, Lindbergh's subject is a slinky caricature of humanity, and the harder she tries to act pedestrian — staring ahead impassively, seemingly oblivious to the camera — the greater the visual discontinuity. The reader wants to place her on a Paris runway, not a filthy sidewalk. So we're back to apples and oranges. Interweaving Lindbergh's photos with Winogrand's is problematic. Yet the two photographers do share something in common. Both are prime exemplars of the male gaze. By his own admission Winogrand was particularly drawn to female subjects. "Whenever I saw a beautiful woman," he shrugged. "I gave my best to photograph her." Of course it wasn't just women. Winogrand was a rapacious people watcher and photographed everyone. But when his camera turned on women, street photography's exploitative nature and underlying power dynamics came to the fore. If you buy the explanation offered by Ralph Goertz in the book's opening essay, Winogrand's male gaze was innocent enough. "Winogrand did not regard the women as objects," he surmises, "but he succeeded in bringing their inner beauty to the forefront." So Winogrand's Women Are Beautiful had nothing to do with objectifying the female body? Was it about "inner beauty" all along? That idea might come as a surprise to Helen Gary Bishop, who penned its introduction, or to the book's many perennial critics — it was generally panned upon release as shallow voyeurism, especially by feminists, and the criticism since has not abated. I don't mean to rehash Winogrand's sexism here. His male gaze may not be politically correct but it remains an essential strain in his character and his work. Of course since his time the photo world has generally become more aware and inclusive — helped along, ironically, by the critical reaction to Women Are Beautiful — bringing Winogrand's biases into sharper focus. Lindbergh Winogrand Women has a few production problems that hinder the effort. There are three essays, two of which are translated from German. Unfortunately these translations contain several grammatical errors and misspellings, and at least one short passage repeated erroneously. The layout into justified paragraphs is flawed. Some photographs are uncredited. A handful of Winogrand's color shots, published here for the first time and one of the book's highlights, is inexplicably missing captions. Eugene "Adget"'s name is misspelled. And so on. These errors are all minor. The real shame is they might have been ironed out with just a quick half hour of proofreading. The fact they remain in the book gives it a rushed, amateur quality. As a last small aside, the book's reproductions are somewhat dark and muddy.